The Canon EF 25mm Extension Tube II is used to allow a lens to focus closer than it does natively. This is accomplished by moving the lens 25mm farther away from the camera body's sensor/film plane by fitting between the camera body and the lens. Based on this rough rule, the Canon EF 25mm Extension Tube II mounted between the camera body and a Canon EF 50mm f/1.4 USM Lens will result in a .5x magnification gain (25mm divided by 50mm). Specific maximum magnification values for most lenses reviewed on the site are included in the Lens Specifications and Measurements Tool. Close-up lenses such as the Canon 500D Close-Up Lens result in higher magnification when used with longer telephoto lens but shorter focal length lenses result in higher magnification when used with extension tubes. Close-up lenses can only be shared with other lenses with the same filter thread size, but extension tubes can generally be used on all lenses. The other disadvantage of close-up lenses is that they have a short focus distance range - much shorter than extension tubes. Not only do extension tubes reduce minimum focus distance, but maximum focus distance is also reduced. While not welcomed, this is part of the optical change made by the ET. For example, the Canon EF 300mm f/2.8 L IS Lens focuses from 5.5' to 12.2' with the 25mm extension tube installed. Another downside to extension tubes is corner vignetting introduced on Full Frame camera body images. There is also a slight degradation in image quality as the enlargement process also enlarges any distortions in the lens. 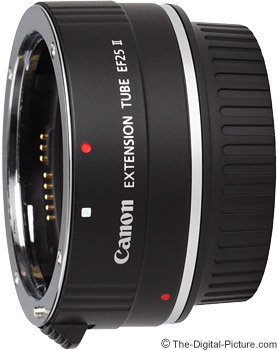 The Canon EF 25mm Extension Tube II is updated to be fully compatible with Canon Digital EF-S lenses, as well as standard photo EF and TS-E lenses. Autofocus (except on TS-E lenses of course) and auto exposure are maintained when using these compatible lenses. There is some light lost when using extension tubes - the more extension used, the more light is lost. Functioning auto exposure will take care of correcting the exposure for you. A white-index mark is provided for Canon EF-S lens installation alignment and a red mark is provided for Canon EF lens installation alignment. 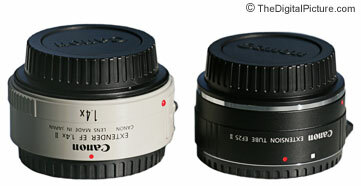 The Canon EF 25mm Extension Tube II (above right) is similar in size to the Canon EF Extender 1.4x (above left). Kenko and other brand extension tubes are available for less money. Since extension tubes have no optics inside, Canon air is no better than Kenko air. The Canon has a few niceties such as the an included storage pouch, nicer caps and a nicer textured finish. There is something psychologically nice about the matching "Canon" label as well. Extension tubes are commonly used for macro photography. The Canon EF 25mm Extension Tube II does the job well - and is small to pack with you, but I still like a true macro lens such as the Canon EF 100mm f/2.8 L IS USM Macro Lens or the Canon EF 180mm f/3.5 L USM Macro Lens best.